Of Gentlemen and Cowards (2010-present) is a Pop band from Hamilton, Ontario, Canada. ormed during their freshman year at McMaster University in Hamilton, Ontario, the band opened for business on November 2, 2010 with the membership of Josh Dawson (bass, vocals), Simon Edwards (lead vocals, rhythm guitar), Christian Fedele (lead guitar, vocals) and Jake Warren (drums). Their musical style is a blend of singable catchy guitar-pop and old fashioned rock 'n' roll. Their tight vocal harmonies, catchy melodies, and foot tapping hooks are reminiscent of record collections of 50-60 years ago. These self-proclaimed 'music nerds' create modern pop music with an old school twist. Since releasing their demo EP, Threads (2011), Of Gentlemen and Cowards have continued touring and releasing music. The Warminster (2012) single, was described as a feel good pop record (actually released in 45RPM format). The band followed up with a more rock-oriented record, Little Cracks, Little Light that same year. Their first LP is due in 2016 but the list of singles to date include: Song for You (2011), Paper Planes (2011), Save Me (2011), Concert to the World (2011), The Grey (2013), One of Those Days (2012) and You & I (2011). In September of 2015 the band appeared on The Late Show With David Letterman to promote the film We Made This Movie; their song Save Me is on the official soundtrack. Putting on a couple of more miles to their band van called: 'The Millennium Falcon' the act appeared at the Sound of Music Festival in neighboring Burlington, Ontario, Canada in June 2016. 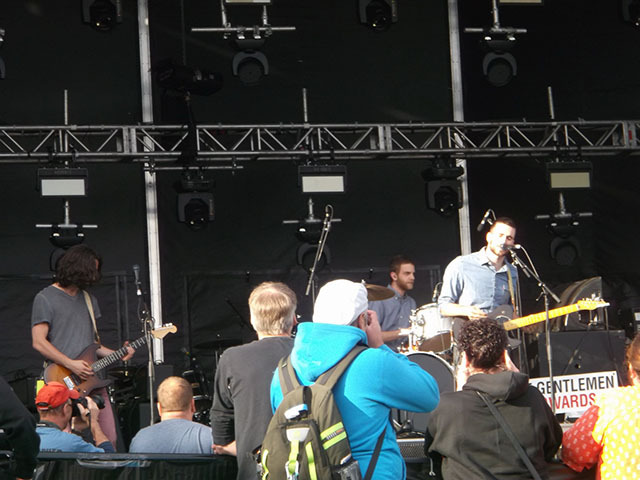 Of Gentlemen and Cowards perform live at the Sound of Music festival in Burlington, Ontario, Canada, June 2016. Source: Derek McDonald.